Original review written in June 2013 -- edited and re-posted. I read The Nightmare Affair in 2013 when it was first published and when I was just getting further into my Young Adult literature fad. At that time, it soon occurred to me that all books seem to be becoming trilogies, so I decided to hold off on reading the second book until closer to the third book’s publication date. Of course, at that time, the third book hadn’t even been announced yet, but if it’s one thing you learn quickly, it’s to expect there to be three books and be slightly mollified if the author simply does a duology and calls it good. 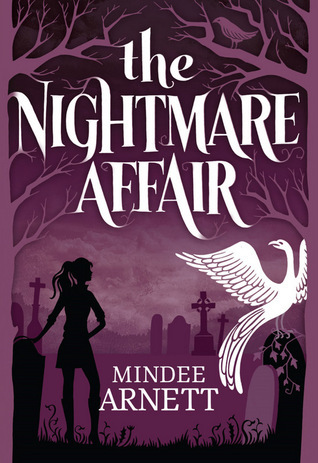 In preparation for reading The Nightmare Dilemma for my 2015 Reading Assignment Challenge (and subsequently finishing the series with The Nightmare Charade) I chose to listen to the audio book version of The Nightmare Affair to refresh my memory. Needless to say, while still quite enjoyable, my feelings about The Nightmare Affair didn’t change… although I DID find it necessary to edit and rewrite my initial review of the book. The following is a rewritten review using a lot of the same things I’d written about it previously with some new, added thoughts. So really, aside from these first three paragraphs and some rephrased thoughts below, not much has changed. To begin with, a lot of the elements in this book had reminded me of Harry Potter--more than likely it had to do with the "Hidden World in an Urban Fantasy with Magic Included" vibe I was getting. Because a whole lot of factors in this book had a world of potential all on its own. The concept of Arkwell Academy is great and I loved the idea: A school for fantasy creatures and magickind, all hidden in plain sight among the “Ordinaries” (the Arkwell Academy equivilent of Muggles, though in this case, the characters in our magic world are either part human or not human). I love these kinds of stories because there is potential for so much to happen and so many books to be written within this extensively created world alone. I think that's the joy of urban fantasies, in that the story doesn't have to end with our specific main characters alone, but can be expanded into spin-off tales if the world is extensive enough to hold many other potential main characters. The characters of The Nightmare Affair were likable and readily relatable. Dusty is fun and sarcastic, Selene is down-to-earth and an awesome best friend. Eli was made out to be the typical popular, good-looking high school boy as the potential love interest… but then he starts spouting investigative ideals and emanating vibes of wanting to be a police officer and follow in the footsteps of his father--then I start grinning about it because I think it’s nice that the main male character in a YA book isn’t broody and misunderstood and rebellious, and that his actions and his dialogue make him more accessible and kind of cute to boot. The characters had a lot of potential. But in a way, they felt a little underdeveloped. They sound great on paper, but in action felt kind of bland. Dusty’s voice was almost too monotone at times--she did a LOT of telling. Her narration sometimes sounded detached, like she was reading a documentary version of her own story rather than relating things as they went. I like where the world and story of Arkwell Academy is going. I like that the main romance kind of took a back seat (although Dusty’s emotions were all over the place and it might just take until the last book to settle down). The murder mystery was predictable, though. It didn’t take long to pinpoint who the mysterious “F” was, as well as hand-pick the villains from the rest. A lot of the surprise twists were a given. Although, the mystery was still written fairly well. The Nightmare Affair is an excellent book on many levels, but it never really penetrated that “It has great potential” barrier. When it felt like things might start getting better, it just fell slightly short for one reason or another. Nonetheless, the possible potential of this world’s direction is probably what will keep me reading until the conclusion.